My main goal with this blog is to share some of the more eclectic archival material I've come across while researching 1990s new media publishing cultures. The b-sides and rarities that didn't make the final cut of my dissertation, so to speak. In that spirit, here is a 1993 advertisement for Wired magazine that looks like it ran on MTV, or at least borrowed the latter's jarring, animation-heavy visual style. It introduces Wired with the terms "Digital" and "Mindstyle," spliced in between imagery that also recalls the cult TV show Max Headroom. 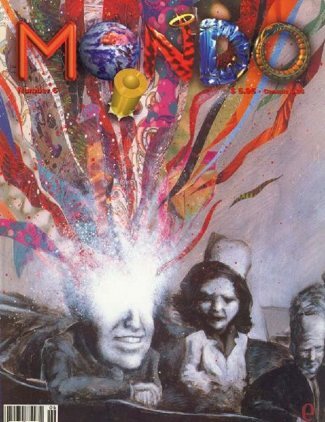 "Mindstyle" is significant because this term was appropriated from Mondo 2000, another tech-culture magazine that - for a brief moment in 1993 - seemed to be on the cusp of the mainstream success that Wired would soon enjoy. Almost immediately after Wired appeared, Mondo's editors took to the WELL to point out stylistic similarities and call the new magazine "the Monkees." The co-optation argument, however, fails to recognize a subtle but important difference between Mondo's 'rebel cool' and that found in previous subcultures. Where subcultures are typically conceived of as 'outsider' scenes, from those in the counterculture that consciously 'dropped out' of mainstream society to more recent outsider scenes like punk and rave culture, the subversive computer culture Mondo proclaimed to represent was different. To borrow a key theme from Alan Liu's book The Laws of Cool, Mondo's cyberculture is best described as a scene of insiders-outside and outsiders-inside. The ideal subversive computer culture was something simultaneously inside and outside of mainstream, corporate America - for example, the corporate- and state-employed hackers and cyberpunks that Mondo imagined to be driving a social and cultural revolution from "inside the belly of the beast," as Robert Anton Wilson wrote in the magazine's first issue. Wired's style was similarly built on this contradictory positioning. Think, for example, of its portrayals of tech CEOs as rogue upstarts, as outsiders bringing about a subversive future from inside the system. This was also the essence of how Wired itself was imagined and operated - as an independent magazine that would infiltrate and revolutionize the mainstream publishing industry (on this, see especially Gary Wolf's history of Wired, in which he often points out Louis Rossetto's ambivalent relationship with his traditional publishing 'peers'). This was not a co-optation of Mondo's style, but an elaboration of its outsider-inside identity. It has been 20 years since the 'mindstyle moment,' but it's worth noting how a similar dynamic and style continues to mark the appearance of new media forms and novel web publishing enterprise. Early, influential bloggers, for example, often positioned themselves similarly - as journalists (or journalist-like publishers) operating outside the norms of their profession, as writers moving beyond the constraints set by the publishing industry, as tech workers and commentators with an independent voice, and so on. This would persist even in the commercialized context of blogging later on. Microsoft's famous company blog by Robert Scoble, for example, was generally portrayed as an outsider's view of the company from within. I would go so far as to say the "insider-outside" or "outsider-inside" voice remains one of the key generic conventions of blogging, or at least of blogs that would be considered prototypical. And I would go further in saying that this extends to other new media publishing forms that would be considered "webby," if not actually a blog.